The most popular biblical software for Windows in the former USSR. Author - Timothy Ha, a Vietnamese who lives in Russia. Due to its simplicity, intuitive interface and open source code, the program became the most popular in the post-Soviet space. Module Editor for a quote from the Bible. The program will allow without knowing the tags and other subtleties html code formatting to create modules. 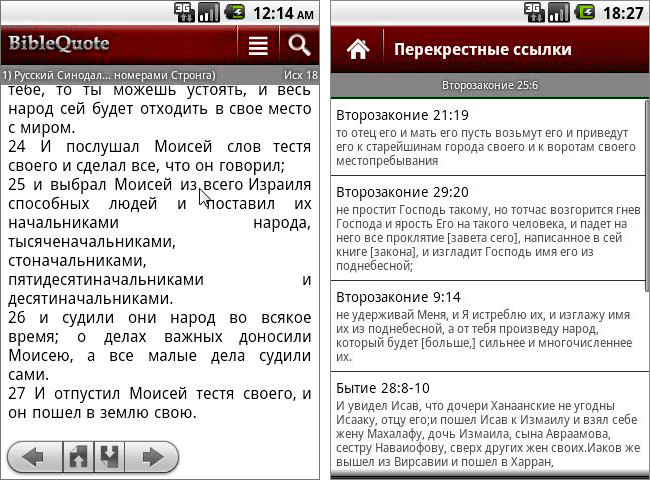 Quite a popular version of the jBible for mobile phone. But here's a version for the iPhone. Remembers the place where finished reading, and left the program. Includes 6 Bible reading plans for the year. A quote from the Bible, a version for Pocket PC. the Most popular electronic Bible PDA. The revival of the legendary Bible Quotes. It immediately becomes clear that other people are engaged in the program and that this is another program that uses the Citations modules. However, part of the code of the old Quotes is still used. The first thing that catches your eye is fresh and light. I like the style. New logo is simple, speaking and original. This is exactly what the logo should be (take a look at the logos of Mercedes, Apple, Nike). Immediately it becomes not convenient, because I'm used to the old quote. But, it is recommended to spend some time and sort out the simple menu. Some of the functions are becoming more convenient, for example, flexibility with windows. Some functions are inconvenient, for example, work with a dictionary. In any case, this is the first version and something will still be raw. And something is just unusual.